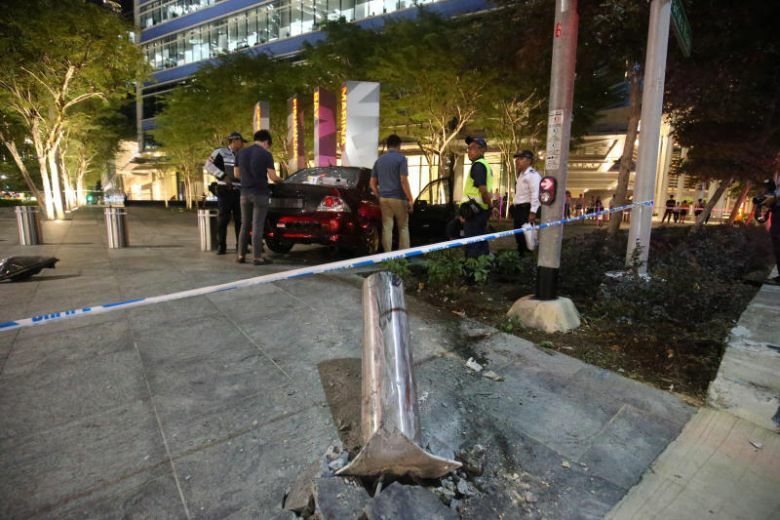 SINGAPORE - Four people were injured on Monday evening (April 15) after a car crashed into a metal bollard along a pavement at the Marina Bay Financial Centre (MBFC). The car's driver, a 25-year-old man, has been arrested for causing grievous hurt by negligent act. Police said they were alerted to the accident at the junction of Central Boulevard and Marina Way at 6.08pm. Three female pedestrians and a male car passenger, aged between 35 and 46, were conscious when taken to Singapore General Hospital. The Singapore Civil Defence Force (SCDF) confirmed that four people were taken to hospital and said it was alerted to the accident at the junction at 6.10pm. The severity and nature of the injuries are not known. But it is understood that at least one victim's injuries were treated as urgent. An eye-witness, a lawyer who wanted to be known only as Xin Heng, said she had just crossed a pedestrian crossing along MBFC when she heard the sound of brakes screeching behind her followed by a loud bang and a woman screaming. Ms Xin Heng, 29, who works at MBFC, turned and saw that a car had knocked over at least one metal bollard along the pavement. "If I had taken the lift later or walked 15 seconds slower, (one of the victims) would have been me," said the lawyer who was shaken by the accident. Photos provided to ST show a red car on the pavement near the MBFC tower with a large crowd gathering at the site of the accident. Ms Xin Heng said that among those in the crowd, some appeared to be trying to help the accident victims. "I hope no one's hurt. I'm quite touched that (so many people) immediately went to help." 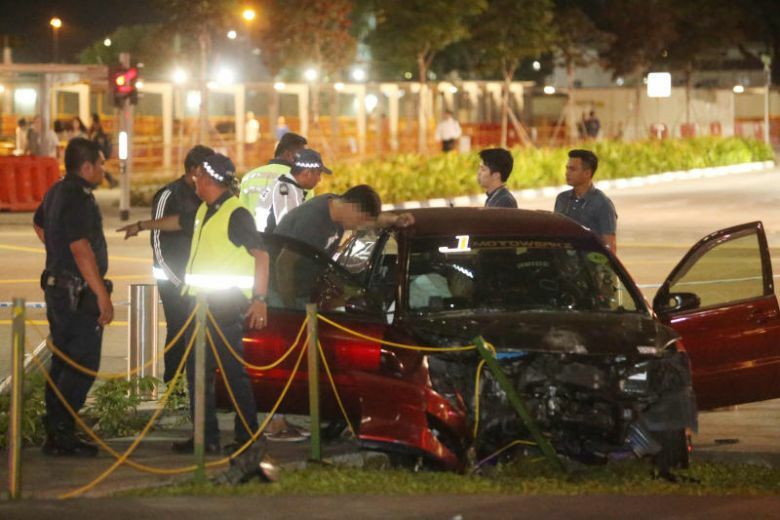 Mr Sufyan Selamet, 25, who was a passenger in a car that drove past the accident site around 7pm, said that he saw many police and Singapore Civil Defence Force (SCDF) personnel. "We saw a car that looked like it had crashed into a steel barricade, and there was definitely more than one ambulance" said Mr Sufyan, who works as a user experience designer at a tech firm.